Concept: Launch an interactive video campaign tied to the new documentary series, “America to Me,” on Starz that encourages students to share their spoken word poetry. Objectives: Create a deeper relationship and lasting impression with the shows fans; showcase and highlight student spoken word poetry. America to Me, a 10-part documentary series from from Emmy Award® - winning and Oscar®- nominated filmmaker Steve James and Participant Media follows students, teachers and administrators in suburban Chicago’s Oak Park and River Forest High School, one of the country’s highest performing and diverse public schools, over the course of a year, as they grapple with decades-long racial and educational inequities — in addition to the challenges that today’s teenagers face. To support the STARZ Original Series. the network launched a spoken word contest that challenges students ages 14 to 19 to answer the question, “What does America mean to me?” in a 60-second original spoken word video. From now until October 7th, students will be able to submit an original video in the form of poetry, a song, or rap for the chance to win a $25,000 scholarship! Following the entry period, fans will be able to view the submissions and vote on their favorites between October 14 and October 22. The submissions are already as impressive and smart as the series itself, which has taken advantage of its long-form format to bring viewers in and form real connections with the docu-series students, teachers, and parents. If you haven’t checked out the series yet, be sure to check it out on Starz here. 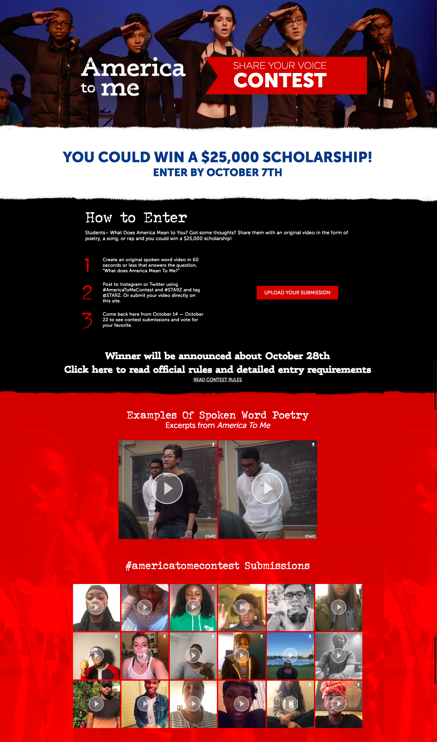 You can view the submissions for Starz’ “America to Me” spoken word video contest here. Starz’ DCI score will be a combination of an Engagement Score (ES) and Virality Score (VS). Their campaign is built around creativity, strong storytelling and deeply personal content, crafted to keep their fans wanting to hear more. Let your consumers get personal. More so than photos, video offers consumers the chance to open up and get personal with a brand. Having consumers speak to what they love, hate, or feel is a powerful tool for building brand loyalty and increasing the chances they will share with their family, friends, and social networks. Video is red hot. Video continues to outperform all other forms of content and brands and marketers are in a great position to leverage enthusiasm for video to activate consumers. Learn more about the value of adding video to your next campaign here. It all comes down to the framing. Starz added a small custom branded video frame that featured their logo as overlays for the videos submitted. Branded frames are a great way to tie content being shared back to your brand and campaign. So, if you haven’t yet, head over to Starz’ campaign website to view their video gallery and check out some of the amazing video poetry submissions they have already collected, and be sure to check back on October 14th to vote for your favorite student piece.